Joy. The joy of meeting an old friend who has had a new experience. There's power in that moment. There's awe. That feeling is an amazing one, when you realize what you hold in your hand. The young boy in the video feels the thrill of space in the very palm of his hand. It is the same sort of awe I felt when I opened an unassuming cardboard box earlier this year. Inside were two small plastic canisters with the intimidating label, "Caution - Radioactive Material." And safely tucked inside each, in a nest of cotton, was the real. When the Trinity Test was preformed in July of 1945, the massive atomic fireball, the first ever massive atomic fireball sucked sand from the desert floor into the smouldering nuclear cauldron hovering momentarily over the New Mexico landscape. The sand melted and fell, a rain of molten green silicate. 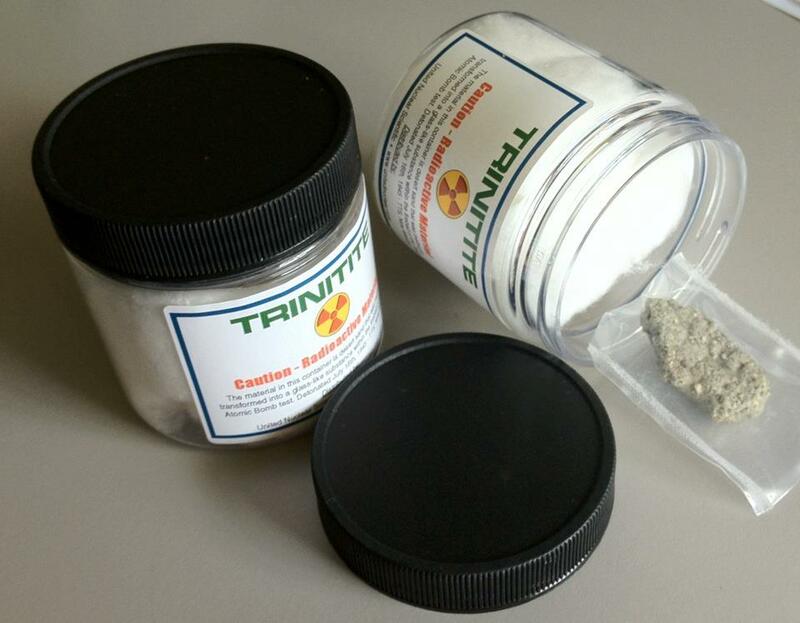 "Trinitite," was born, the curious byproduct of brilliant minds working toward fantastic and catastrophic ends. And inside each of the containers that arrived on my doorstep this past summer sits a sliver of Trinitite, a small piece of that greenish nuclear glass. It's real. It's an actual piece of the past. It's amazing to hold that in your hand (don't worry, it's relatively low-yield in terms of radiation and mostly safe to handle as long as I don't butter my toast with it or something). When I hold it in my hand, It's like I can feel the heat. It's like I can see the light of the growing fireball. I feel the doubt of Robert Oppenheimer as he questions the very morality of science. I can hear the echo of his words in my head: "Now I am become Death, the destroyer of worlds." A photo of that sliver of nuclear glass doesn't do it justice. Pixels glowing on a screen aren't enough. Looking at the real thing with your own eyes, feeling it in your hand, turning it over between your fingers is immensely powerful. part science but all proof of the past. Technology is a wonderful thing, but it can never replace the sheer thrill and true meaning-making moment of seeing the real things. There can never be such a thing as a "virtual visitor center." We need places where we can see, touch and witness "the real." Charles Willson Peale realized that fact in Philadelphia in the 1780s, and Americans have been fascinated by the temples of "the real" ever since. The buildings we invest millions in at each of our sacred secular temples are shrines to the real evidence, they are the proof that the past actually happened. Oftentimes, pixels on a smartphone can't do "the real" justice. Sometimes those things need to lie behind glass in visitor centers, on display to prove that the sadness of the past was a real, tangible thing. Sometimes we can hold those pieces of "the real" right in the palm of our own hands, mailed from a certified mineral supply company direct. And sometimes we can pick them up in a nearby cornfield, a space traveler come back to earth and returned to his best friend.